Fruit color is white-green the peel can be yellow, orange, pink or more than one color. 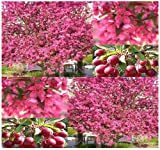 Is it necessary to graft in Malus Evereste? What can be done with big quantities of Malus Evereste fruits?